When we think of Mars we may conjure up images of a dusty terrain and red atmosphere (or maybe even Matt Damon after his award-winning performance in the hit Mars movie). But the more we discover about this unique world, the more we realize just how much is really going on up there. Take the dust devils for instance. These twisting cyclones of dirt and debris are giving this planet a whole new image…the King of Dust Devils! Check it out! 1 What are dust devils? 3 So how do these dust devils become so large on Mars? 4 What does that mean for Mars? Here on Earth dust devils are often associated with desert regions and open plains. In the right conditions, thin layers of heated earth will spiral up into the cooler layers creating a mini-tornado. Albeit small, this vortex can still pick up loose debris, carrying it high into the atmosphere. Mars is inherently dusty, in fact it is constantly being shaped by what is known as “aeolian” or wind-blown processes. 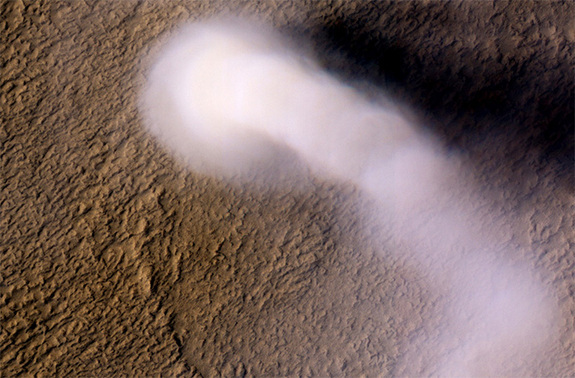 The constant movement of air on the Red Planet, not only changes the terrain, but does kick up these impressive dust devils — the dust devil in the image taken from NASA’s High-Resolution Imaging Science Experiment (HiRISE) camera, puts this dust devil at 12 miles high (19 kilometers) and 420 feet (128 meters) in diameter — much larger than those found here on Earth! So how do these dust devils become so large on Mars? What does that mean for Mars? Not only are these dusty tornadoes impressive, but they also play a major role in transporting the fine dirt particles from the surface of Mars and injecting it high into this planet’s atmosphere, which in turn could be the cause for the planet’s global climate. To better understand this phenomenon studies were done here on Earth by using meteorological data from dust devils found in Australia then comparing those with observations by NASA’s Viking Lander mission. Supervisor Udaysankar Nair of the project, sheds some light on the findings. In a statement he reveals; “the Martian air is so thin, dust has a greater effect on energy transfers in the atmosphere and on the surface than it does in Earth’s thick atmosphere." Since researchers already know the atmospheric-dust during the daytime on Mars reduces the amount of sunlight that could otherwise heat the surface and during the night this same dust in the atmosphere emits long-wave radiation (warming the surface) these dust devils (and their aftermath) could be an important link to furthering our knowledge of the climate on Mars. Name a star now! - Mars… The King of Dust Devils!